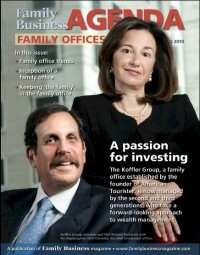 Sol Koffler set up the Koffler Group family office in 1979 with assets from the sale of the company he founded, American Tourister. At the time it was the second-largest luggage company in the U.S, and he built it without ever borrowing a dime. Carrying debt violated his old-school principles of doing business and, it turned out, of investing as well. For the 17 years he ran the family office, he was content with modest growth—the best strategy, he believed, for preserving his family’s wealth. After accumulating a massive fortune, John D. Rockefeller could have selected a bank or stock brokerage to manage the assets. Instead, he decided to hire his own staff in 1882. The Rockefeller employees who managed the oil magnate’s money and philanthropic activities formed one of the first family offices. Today there are some 3,000 family offices in the U.S. Many have opened in the last decade, as families have sold their businesses or taken them public. The single family office structure: Will it stand the test of time? It is said that only about 12% of family businesses survive until the third generation and even fewer to the fourth generation and beyond. There are many reasons for these failures—poor management, poor timing, globalization, competition and, of course, the effect of taxes as a destroyer of wealth. As the owner of a family business, you understand the importance of succession planning to ensure that the enterprise you worked hard to build lives on through future generations. The same kind of thoughtful, careful planning is necessary to preserve the wealth that you have accumulated as a result of your success. Yet preparing future generations for the responsibility of wealth stewardship can be a challenge. On the list of roles and responsibilities of the family office, none is more important than the preservation and proper investment of the family’s wealth. But what does this endeavor actually entail? Setting up a family office takes time and clear thinking, as many families who have one can tell you. It’s a time-consuming process, so it’s better to start thinking about it before you’re in the throes of selling a business and planning a major lifestyle change. To this day, Apollo 13 remains one of my favorite movies. Many of us are old enough to recall vividly those anxiety-filled hours of the 1970 space mission. The true story involved an experienced Houston-based ground team, working in a trial-and-error crisis atmosphere, to create workable technology with nothing but the on-board components available to a trio of isolated astronauts. American ingenuity and dogged teamwork resulted in the safe splashdown of a damaged space capsule, preservation of three astronauts’ lives and the strengthening of a nation’s ego.